Hello and welcome to Friday's bulletin. Your most trusted port of call for the best ecommerce news from the week gone by. In other news this week; a seagull was dyed orange after falling into a vat of curry (Gulfrezi anyone...? ), Nerf gun father-son love went viral and Brit pop favourite Ed Sheeran is being sued for £20m after 39 alleged "identical" notes. Before you head into Friday blinded by the saucy temptress of the weekend, swot up on what's been making the headlines this week, and make sure you're one step ahead of those pesky competitors come Monday morning. As per, look to GIF for that special #FridayFeeling. Shoppers cannot legally be denied the right to buy goods online, the Government has ruled in a landmark move against one of Britain's biggest golf club manufacturers. It was ruled that Ping has breached UK and EU competition laws by the Competition and Markets Authority (CMA) by preventing retailers from selling its products online. Experts have labelled the CMA's decision as "staggering", predicting that retailers operating similar practices could also be forced to remove online selling bans. Speaking to the Telegraph, Andrew Hall, a retail consultant at Verdict Retail, said: "It is hardly surprising brick and mortar stores feel the pressure to fight back against the severe competition of the online market. Online sales can cannibalise physical store performance, and given the higher costs involved with physical store formats it is unsurprising the likes of Ping would seek to redirect sales back towards their stores through an online sales ban." A spokesman for the CMA said: "The internet is an increasingly important distribution channel and retailers’ ability to supply via this channel should not be unduly restricted." 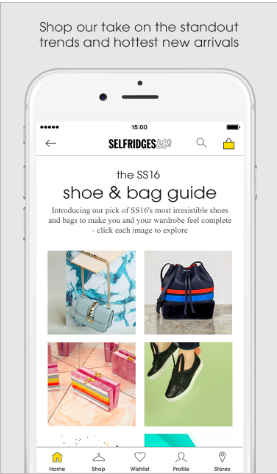 Selling superstore Selfridges has unveiled a shoppable app to cash in on growing mobile traffic, with 60% of its online customers accessing the site from their mobile devices. Customers will be able to purchase items from the store and Selfridges’ Instagram feed via the app. The 'pocket-sized Selfridges' app boasts a mix of magazine content, straight-forward edits, and brand promotion - and has been credited for its push for personalisation and social media integration, in a largely glowing Econsultancy review. Nine out of 10 people said free shipping was the main incentive to shop online more often, according to a new US study. Surveying more than 1,400 American consumers on their shopping habits, the Walker Sands: Future of Retail 2016 study further found that almost a third of consumers (31%) shop online at least once a week, compared to 22% last year. Other findings included: of the most frequent online shoppers, 50% reported using one-day shipping, and 85% have used two-day shipping, with 60% of frequent shoppers having purchased products online to pick up in store (click and collect) - four times more than the consumers who shop online only a few times a year. Interestingly, 79% of respondents said it's likely they would choose drones as a delivery option. From Thursday (9th June), Amazon Prime customers (in central and east London) will be able to order some spuds and get them delivered the same day, as the online retail giant looks to grab market share from established food retailers. The move has been dubbed a "disruptive game-changer" by industry insiders, similar in weight to the entry of Lidl and Aldi to the British supermarket scene. "Convenience, ultra-competitive pricing and customer service will find favour with urban shoppers and will heap immediate pressure on retailers that do sizeable business in the capital," said retail expert Bryan Roberts, speaking to the BBC. Online shopping was behind growing retail sales in May, with growth in non-food products up by 13.7% year-on-year. However, in the three months to May, store sales decreased by 1.6% - the steepest drop since December 2012, according to the BRC-KPMG - as the high street feels the blow of falling footfall and the demise of BHS and Austin Reed. Online sales accounted for 21.2% of the total non-food sales across the UK, compared to 18.9% in May last year - marking the fifth month in a row that the online penetration of non-food sales was above 20%.